Emma Howells with her front-page photograph. 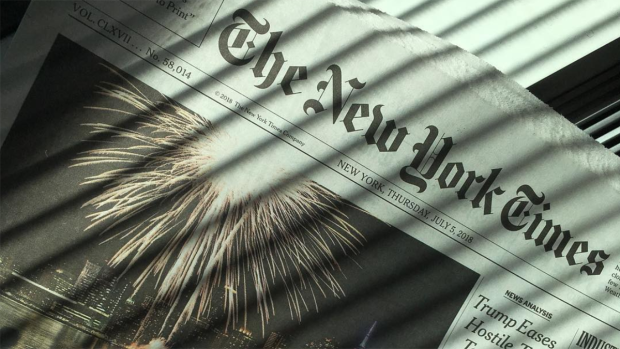 For National Intern Day, NBC New York intern Sarah Kolodny spoke with a New York Times intern on how one of her photographs made the front page of the iconic New York newspaper. "Peak stress." That's how New York Times newsroom intern Emma Howells describes the moments before she submitted a photograph earlier this month that -- unbeknownst to her -- would make the storied newspaper's front page. It was Independence Day and the 22-year-old been sent on assignment to cover this year's Macy's Fourth of July Fireworks. Howells had a tight deadline, a heavy bag of gear and a ringing phone. "I was in a state of high stress, it was pretty nerve-wracking. I was trying to confirm a couple of details for the caption, so I was running around the city trying to find a policeman or someone in charge and I had my editor calling." Assigned to shoot the fireworks at 9:30 p.m., with a deadline of 9:45 p.m., getting the perfect photo was a race against the clock. Earlier that day, Howells had been preparing: shooting and transmitting photos from her camera to the office. The front page of the New York Times July 5, 2018, featuring photo intern Emma Howells' image. But once she arrived to the scene and began to shoot, she found her internet connection had slowed to a snail's-pace due to the masses of people. She used her initiative and managed to hook into the Wi-Fi from a nearby hotel to transmit her photos. The stress paid off. The night editor phoned her to confirm she got the image and caption and told Howells: "We got it on the front page." “I was so dizzyingly shocked and happy," Howells said. The exhausted intern said she fell asleep on the train on the way home, but woke up the next morning to see her photograph on the front page of the The New York Times of July 5, 2018. “It's sometimes hard for me to wrap my head around the fact that I'm achieving what I set out to do in high school. It's immensely validating to realize that all of the work I've put in for years is finally paying off." A Washington, D.C., native, Emma Howells will soon be a college graduate of Ohio University. The talented photographer said she "worked her way up" to an internship at the iconic New York City paper, first interning at Tulsa World in Oklahoma and The Columbus Dispatch in Ohio. She threw her name in the hat for an internship at The New York Times close to deadline and didn't expect anything. Soon after, she picked up a voicemail over the car speaker while driving in Ohio. It was The New York Times, offering her the dream internship. "I was laughing so hard...I was just shocked, I didn't expect to hear it," she said. She said with the access everyone has to a camera nowadays, photography has become a more popular hobby. Howells said she believes this creates a new degree of commitment required for professional photographers versus a hobbyist. Professional photographers must “eat, sleep and breathe photography”, and have a totally different thinking process of their environment and the world around them compared to those who do photography as a hobby. When she graduates, she hopes to continue her adventure in New York City, making money from doing what she loves: taking photos. See more of Emma Howells' photographs on her website.